Miracles in Action empowers Guatemalans living in extreme poverty to help themselves through sustainable projects that improve education, nutrition, vocational skills and job creation. Miracles In Action is committed to providing clean drinking water so that children are healthy and can attend school to better their futures. Water related illnesses are a top killer of children in developing countries. 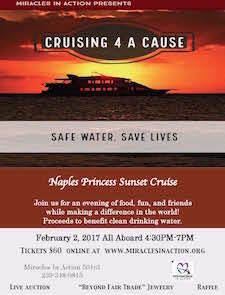 On February 2nd, Miracles In Action will partner with the Naples Princess Cruise and Survivor Guatemala’s Cindy Hall to save lives by bringing clean drinking water to a village in rural Guatemala. Includes an evening of food, fun, and friends while making a difference in the world! Enjoy stunning “Beyond Fair Trade” jewelry for sale, live auction, and raffles! Proceeds benefit clean drinking water to save lives.